In WWI, the Americans were not put on a rationing system but were asked to eat more fresh fruits and vegetables and less meat and wheat products. In WWII, Americans were put on a rationing system that became stricter as the war went on. Even then, this country imported a lot of food and supply chains were disrupted. In addition to that, the troops needed food overseas that would ship and travel well. We were asked to give up or limit certain foods to feed our troops which we did because we were patriotic and felt it was our duty to do so. Certain foods were not available because they were not in season or able to grow in the United States. In today's America, this seems like a foreign concept. Food is literally everywhere! However, we have situations that can happen to start having our food rationed. Most grocery stores have only three days of food on their shelves in their storage rooms. If a blizzard or some other weather storm happens, those shelves will be wiped out in hours. Our local grocery store can be very short on supplies on Sunday because a lot of people get groceries on Sundays. Now, imagine if there is a disruption in the transportation system. No trucks bringing food to the stores means a limited supply or no food to buy. Imagine if we went to war again. A good deal of our food or ingredients for our food is imported. Less food coming into our country means less food to buy. That will not go over well with some people. Imagine if you could not actually get to the grocery store. Some people are accustomed to shopping every day instead of once a week or two weeks. When food is rationed, often gas and tires are rationed too when will stop someone from going to the store every day. Food will start to be rationed. Just like when food was rationed before, there will be a learning curve. People will have to adjust and some people will not adjust well. People will have to learn how to cook again and grow their own food. Some of those skills are completely lost in our inner cities. What can you do to the beat the rationing system? 1. Food Storage. Now, more than ever, you need to have a food stockpile. No one knows how long food would be rationed for. No one planned for WWII to last for four years. There are still people recovering from the hurricanes last season. Puerto Rico is still getting on their feet and depending on FEMA and donations to feed their people (as of this post). 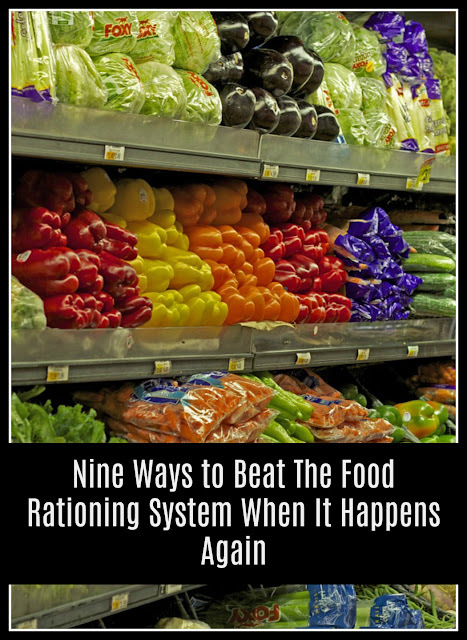 Having a food stockpile is critical and having a year's worth of food is not out of line. 2. Grow Your Own Food. You will have to become your own supplier. If you start gardening now, you will have the skills to grow your own food. You don't even need a garden per say, but it is better to have a plot of land to grow food. However, use containers. Grow lettuce and spinach in pots inside the house. Grow tomatoes on the balcony or the patio. There are many creative ways to grow your food. 3. Raise Your Eggs and Meat. If you can, have some laying hens for eggs. Grow a few meat chickens for your own pot and freezer. If you can, raise more than chickens. Ducks, geese, turkeys, pigs, goats, sheep, and cows can all be raised for butchering. You would be addressing one area of food that was also severely rationed by the end of WWII and probably would be again. 4. Foraging For Food. You should learn to identify weeds and other edibles that can be cooked or eaten in a salad. This was done during both WWI and WWII with excellent results. A great book on foraging and identifying edibles is The Forager's Harvest: A Guide to Identifying, Harvesting, and Preparing Edible Wild Plants by Samuel Thayer. Learning how to tap trees for syrup and collecting nuts should be skills to learn now too. 5. Start Keeping Bees. Sugar was severely rationed in WWII. People are even more addicted to it now than they were then. Keeping bees and producing your own honey would easily help replace sugar or at least keep sugar for more important things. During the war, people would save their sugar for the holidays or very special occasions. They would do without sugar most of the time. We all could benefit from having less sugar in our diets too. 6. Learn To Preserve Your Own Food. Learning to can and dehydrate will become very important skills during a food rationing time. Again, this is a skill you need to learn and practice now. Start simple with jams and jellies and work your way up to making meals in a jar. Getting a good supply of canning jars and canning lids will be crucial too. Metal for those lids could be in short supply. There are non-metal lids to can with also, but they also take time to learn how to use. 7. Learn To Use Everything and Waste Nothing. We can be a very wasteful society nowadays and we really need to learn to use it all up. We need to learn to eat everything, re-purpose leftovers, compost scraps, and feed scraps to the animals. 8. Get Creative. You will have to learn to cook from scratch. You will have to learn how to use food in ways you never imagined. You will have to learn to eat more locally and seasonally. You may have to have odd food combinations at the supper table. Learn to be creative with food and keep an open mind about how to cook and use food. 9. Try New Foods Now. Never had turnips or rutabagas? They grow just about everywhere so now would be a good time to learn how to eat them. They are just examples but learn how to prepare and eat new things especially vegetables. People ate better on the rationing system when they had vegetables available to them. Learn to eat more vegetables and figure out a way for your picky eaters to eat them too. Rationing is never an easy thing, but you can learn to use it to your advantage. If you take steps now to learn these skills and start storing food, you will have an easier time living on a food rationing system.